Think human beings are the only ones who can enjoy tattoos? Ha! Bananas can get them, too. Japanese artist End Cape specializes in giving the yellow fruit tats. His process is time consuming and taxing. End Cape punctures small holes in the banana's skin using a pin, and this causes the peel to "bruise" and change color. And thus, banana tattoo. The entire process can take up to five hours (or more) depending on the image. 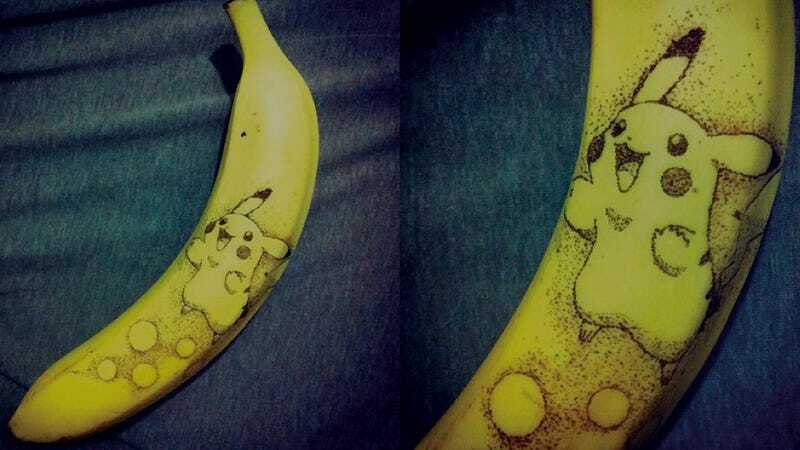 The artist started uploading banana tattoos earlier this spring. This month, he held an exhibition of his banana tattoos at a gallery in Tokyo, and his work has appeared on Japanese television. End Cape should totally collaborate with sculptor Keisuke Yamada for a match made in banana art heaven.